Dr. Graham Emslie, a professor of psychiatry at the University of Texas Southwestern Medical Center who was a researcher in four of GlaxoSmithKline's studies of Paxil, said he suspected that the other studies went unpublished at least in part because the results were unfavorable. "Some of these studies were finished a couple of years ago," Dr. Emslie said. "But negative trials tend not to get published." Dr. Perera, the GlaxoSmithKline official, said that publishing studies "takes time." He declined to say if the company would seek to publish the eight Paxil studies that have not appeared in journals. According to Dr. Emslie, other companies have withheld negative studies of S.S.R.I.'s. "I know of at least a half-dozen other studies of antidepressant treatments in children and adolescents that have been completed but as yet have not been published," he said. "More than enough time has passed for these to be published at least in abstract form." He refused to identify the companies or the drugs involved because he, like other researchers involved in similar research, has signed contracts promising secrecy. With negative results not disclosed, researchers and physicians often believe that drugs are more effective and safer than they actually are, according to Dr. Marcia Angell, a former editor of The New England Journal of Medicine. "It changes the way medicine is practiced," Dr. Angell said. Back in 1991, in their presentation to the blue-ribbon committee reviewing Prozac, Lilly scientists made much of the fact that studies analyzing Zoloft and Paxil failed to show any link between those drugs and an increase in suicides. "There is simply no scientific evidence whatsoever, no placebo-controlled double-blind study, that has established a cause-and-effect relationship between antidepressant pharmacotherapy of any class and suicidal acts or ideation," said Dr. Charles B. Nemeroff, a professor of psychiatry at Emory University who worked as a consultant and spoke on behalf of Lilly. In an interview, Dr. Nemeroff said he believed that his statement was accurate then and remains so, since he has not seen any published study to contradict it. The British and American regulators have reached a different conclusion. And experts hired by lawyers suing the manufacturers over claims that the drugs led to suicides question whether the F.D.A. received a full picture of the available research in 1991. For instance, F.D.A. procedures required Lilly to inform the agency of any concerns about Prozac raised by other national health authorities. But court records show that Lilly never told the F.D.A. or the expert panel that German regulators initially refused to approve Prozac's sale in 1985 because of concerns over a link with suicide. 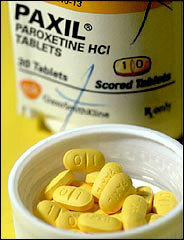 In their analysis of Lilly's data, the German authorities said that Prozac seemed to have caused a substantial increase in suicide among users, according to court records. Ultimately, the Germans approved Prozac with a warning that physicians should consider using sedatives for patients at risk of suicide. No such warning is included in Prozac's label in the United States, although the risk of suicidal thinking is listed among the drug's side effects. Gary Tollefson, a Lilly executive who spoke before the 1991 panel, was asked in a deposition why he did not tell the experts about the German concerns. "That was not a question I was asked," he said, according to court records, "so I did not answer that question." Documents brought to light in other cases suggest that Lilly struggled for years to reconcile suicidal events among patients taking Prozac in its trials. One memo shows that a top Lilly executive asked the company's own researchers to record suicide attempts as "overdose" and thoughts of suicide as "depression." In another memo, a Lilly employee objected to those instructions, making reference to the German health authority, known by its initials as the B.G.A. "I do not think I could explain to the B.G.A., a judge, to a reporter or even to my family why we would do this especially on the sensitive issue of suicide and suicidal ideation," he wrote. In a recent statement, Lilly said: "There is no credible scientific evidence that establishes a causal connection between Prozac and violent or suicidal behavior. To the contrary, scientific evidence shows that Prozac and other antidepressant medications appear to reduce these behaviors." Lilly representatives told the 1991 panel that the company had put together a series of proposed studies to examine the suicide issue and said one of the studies had already been started. According to plaintiffs' lawyers, Lilly never completed the study; Lilly declined to comment. Were the F.D.A. to reconstitute the 1991 panel, its members would again be presented with a confusing mix of data on the issue — despite the passage of 16 years since Prozac's introduction and the use by tens of millions of people of it and other S.S.R.I.'s. Under the circumstances, one member of the panel, Dr. Keh-Ming Lin, a professor of psychiatry at the University of California at Los Angeles, said the new information unearthed by regulators might lead him to change his vote absolving S.S.R.I. 's of suicide risk. "If you have data that's worrisome, you tend to be conservative," Dr. Lin said, "even when the question isn't resolved."